In this precious moment of now we are all being invited to spend time, extensive time in 'the flow'. What does being in the state of flow mean? 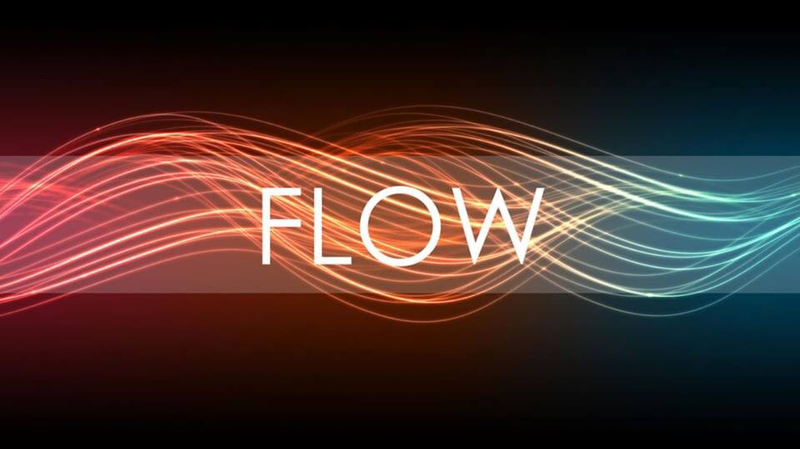 Similar to meditation, the state of flow is an altered state of consciousness, a raised state of awareness, it allows for a connection to be made between all your levels of consciousness. This means it allows you to reach levels of creative abundance and knowing that you don't normally reach in your everyday state. Some feel that it's the process of bringing your higher dimensional self down to merge with your physical, mental and emotional bodies and allowing them to become one, merging and integrating on every level. It's amazing to observe and children have the natural ability and do it often, especially when they are playing and using their imagination. Imagination and the ability to allow yourself to let go of familiar, to make space for the unfamiliar to flow in is a big part of the process. This is were trust plays it's part. Trust plays a big part in the process and this appears to become more difficult the more conditioned we get as we grow older and get more influenced by cultural and societal norms. If differs from meditation in that we are physically doing something which is often the trigger which allows us to enter this state. Activities to help us enter this state are always related to creative pursuits, writing, playing an Instrument, dancing, painting etc. And on a biological view point it is very much a right brain activity. So its possible to start something which fires up your left brain, with the need for logical thinking and rational decision making, but during the process you might switch, your consciousness may lead the way by allowing for your right brain to kick in and take over, which then allows for you to enter the state of flow. A personal example of this is when I bake cakes, I love baking, and flow always occurs when we are doing things from a place of love and joy. So when I start baking, I need my left brain, my logical mind, to get the ingredients, measuring them and follow the instructions, but when I get to the stage when I no longer need that focus, my right brain kicks in, and I enter the flow. Time and space seem to lose its importance and I feel happy and content with myself, sometimes I get insight or information, but I don't hold onto anything, I just allow things to flow. So why is it importance now to experience flow more often? As a species we are evolving, our consciousness along with our planet is moving up the frequency spectrum, shifting to a higher dimensional state of being? We are changing on every level possible, physically, mentally, emotionally and we are becoming more expanded and aware of our divine blueprint, our spiritual nature. Our left and right hemisphere of our brain is going to be reaching a level of balance and Integration which will make it seem that it is unified, one, the functions of the two sides of the brain will no longer function in separation of each other. Therefore we will be living in a constant state of flow, connected, integrated and expanded. To practice going in and out of this state now is important because it allows for you to recognise it, to live with it and to harness it's full potential, you will be embodying your own full potential, you will become the greatest version of yourself. This state allows for you to see and feel what this is like. Many of us, particular individuals that are creative and right brain dominant, and children etc. And going in and out of flow regularly, with awareness of these episodes we can really acknowledge the connection and power they allow us to have giving us the opportunity for further growth and expansion.